Have you ever gone through periods of time where you've been really into something? Seems like I'm always going though phases where I'm infatuated with one thing or another. Today, I'd like to share are few of my favorites that I'm currently obsessed with. There's an Asian grocery store not too far from me. They carry all types of spices and delicacies from the far east. Me? I go there for my gluten free soy sauce and lifetime supplies of toasted seaweed sheets. These crispy treats are so addictive it's not even funny. Years ago I wrote about the benefits of eating super green foods like seaweed. After reading so many accounts of women who had lovely hair and shared that they ate a lot of seaweed, I was convinced. My obsession with these roasted seaweed snacks started out as means by which I could create healthier hair. But I would continue to enjoy them even if they weren't loaded with vitamins and minerals. But they are good for me so it's even better! If you haven't tried these, you've been depriving yourself. I was at the checkout line the other day when my eyes just happen to land on a case of mason jars. Normally, I wouldn't be affected by such a sight. If it hadn't been for the experience at an indie hangout where I was served my mojito from a jar, I wouldn't have made this purchase. 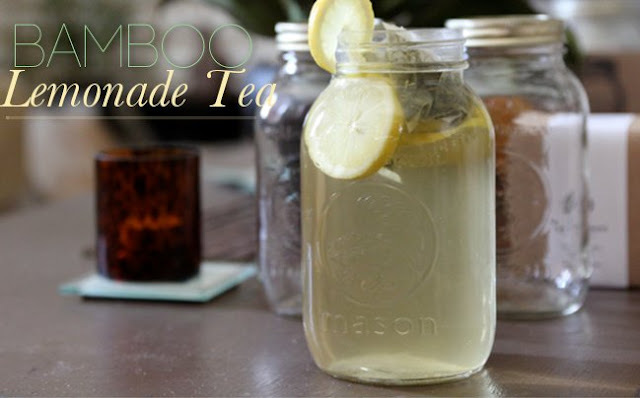 Drinking out of a jar was so enjoyable that I couldn't resist recreating the experience at home with bamboo tea. This weekend I whipped up a batch of tea and infused it with lemon. It was so perfect. My husband seemed to like it as much as me so we refilled the jar several times over the course of the day. Next on my list is this nifty Blendtec blender that I picked up on a trip to Sam's Club. I went in there for one thing and walked out with a state of the art blender. The Blendtec is supposed to rival the Vitamix Blender which is said to be the best in the world. Me and this other lady were pretty much sold the product by a guy who did a live in store demo. Later she told me that she only came in to get a hot dog for her daughter and herself. What sold us is how many options available with this amazing machine. The guy blended ice cream, soup, green juice, fruit smoothies. After purchasing I walked over to their produce section and was approached by one of the employees at Sam's who proudly told me that I wouldn't regret the purchase. He went on to say that he's had his Blendtec for years and enjoyed a smoothie for breakfast that morning. After a week past I had buyers remorse but once I was able to make an avocado smoothie that tastes as good as the Vietnamese restaurant up the street, I knew that this new toy was a keeper. The best part of this purchase was the recipe book. I hope to share some of the recipes with you in the future. The last thing on my current faves list is this Pure Chromatics eye shadow quad from Yves Saint Lauren. I purchased after having received the best makeup session of my life. Seriously, never has anyone done my makeup where I didn't run to the restroom and wash it off immediately after the reveal. She did such an amazing job that I purchased eye shadow knowing that I'd never be able to recreate her work of art. Even though I couldn't create the look, these colors are still my favorite for everyday looks. I've got tons of eye shadow at home (and I mean tons of it). But the quality of the YSL brand can not be compared. I just love the shimmer it gives without being all glittery. I look forward to adding more colors from that brand to my collection in the future. Yessss! To the blendtec blender, I am hoping you post smoothie recipes as I am interested in that avocado one you spoke of. I am going on a 30 day green smoothie challenge during the month of April and I am contemplating purchasing a new blender. I would love to hear more about your experiences with it. My kiddos love roasted seaweed. My daughter calls then green chips!